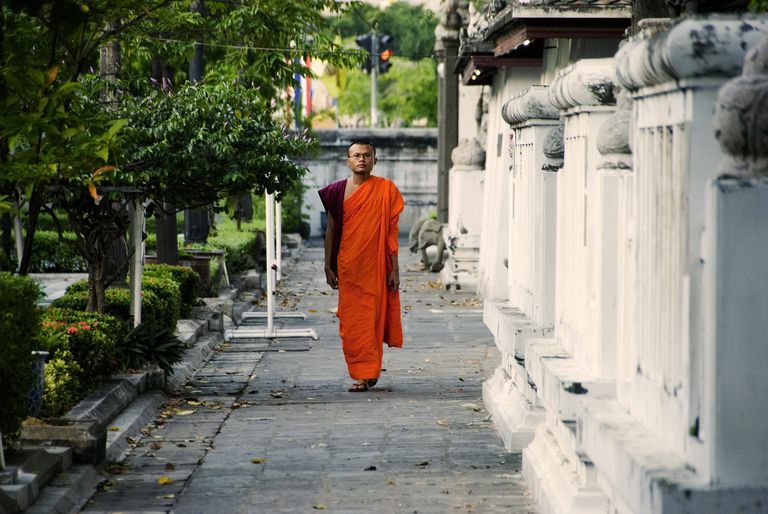 A Theravada Buddhist monk walks outside Wat Mahathat, a temple in Bangkok, Thailand. Theravada is the dominant form of Buddhism in most of southeast Asia, including Burma (Myanmar), Cambodia, Laos, Sri Lanka, and Thailand. It claims about 100 million adherents worldwide. Its doctrines are taken from the Pali Tipitaka or Pali Canon and its basic teachings begin with the Four Noble Truths. Theravada is also one of the two primary schools of Buddhism; the other is called Mahayana. Some will tell you there are three primary schools, and the third is Vajrayana. But all schools of Vajrayana are built upon Mahayana philosophy and call themselves Mahayana, also. Theravada makes two historical claims for itself. One is that it is the oldest form of Buddhism being practiced today and the other is that it is directly descended from the original sangha— the Buddha's own disciples—and Mahayana is not. The first claim probably is true. Sectarian differences began to develop within Buddhism very early, probably within a few years of the historical Buddha's death. Theravada developed from a sect called Vibhajjavada that was established in Sri Lanka in the 3rd century BCE. Mahayana didn't emerge as a distinctive school until early in the first millennium CE. The other claim is harder to verify. Both Theravada and Mahayana emerged from the sectarian divisions that occurred after the Buddha's passing. Whether one is closer to "original" Buddhism is a matter of opinion. Theravada is distinctive from the other major school of Buddhism, Mahayana, in several ways. Most Theravada temples and monasteries are administered by monastic organizations within national boundaries. Often, Theravada Buddhist institutions and clergy in Asia enjoy some government sponsorship but are also subject to some government supervision. Theravada emphasizes individual enlightenment; the ideal is to become an arhat (sometimes arahant), which means "worthy one" in Pali. An arhat is a person who has realized enlightenment and freed himself from the cycle of birth and death. Beneath the arhat ideal is an understanding of the doctrine of anatman—the nature of the self—that differs from that of the Mahayana. Very basically, Theravada considers anatman to mean that an individual's ego or personality is a tether and delusion. Once freed of this delusion, the individual may enjoy the bliss of Nirvana. Mahayana, on the other hand, considers all physical forms to be void of intrinsic, separate self. Therefore, according to Mahayana, "individual enlightenment" is an oxymoron. The ideal in Mahayana is to enable all beings to be enlightened together. Theravada teaches that enlightenment comes entirely through one's own efforts, without help from gods or other outside forces. Some Mahayana schools teach self-power as well while others do not. The primary means of realizing enlightenment in the Theravada tradition is through Vipassana or "insight" meditation. Vipassana emphasizes disciplined self-observation of body and thoughts and how they interconnect. Some schools of Mahayana also emphasize meditation, but other schools of Mahayana do not meditate. How Do Arhats Compare to Buddhas in Terms of Enlightenment?